A lot of folks start their kids out on an inexpensive keyboard or digital piano when they first enroll in piano lessons. Although it is terrific to give your child piano lessons, good piano-playing technique is difficult to achieve without a quality instrument. When a keyboard has spring-loaded keys, the keys just “pop back up” and don’t respond like a real piano. Also, the keys don’t have enough resistance (weight) to build the finger muscles necessary to improve piano technique. It is similar to lifting weights. If you never progress to larger weights, your muscles don’t grow much. To play faster passages with accuracy, a heavier key touch will help develop finger “muscles” and dexterity. During the month of October, Mid-America Piano is offering a generous trade-in allowance for your old keyboard or digital piano toward any new or “like-new” acoustic piano! With over 50 affordable acoustic pianos in stock, you are sure to find an instrument that will inspire your budding musician without breaking the bank. Many of our “like-new” pianos can be financed for as little as $49/month. 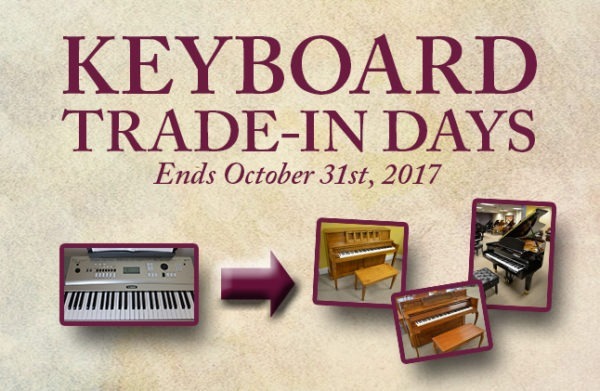 Whether you have a 5 year old Casio, a 30 year old Roland, (or some other keyboard that is past its useful life), it is worth more in the month of October during Keyboard Trade-In Days! We will assist you in finding a piano that will motivate and inspire your family to make music for generations to come! For any questions or for more information visit our showroom in Manhattan or call us at 800-950-3774. We look forward to serving your piano needs!